How to use the Garantme Certificate? Email is good for landlords and agents to store your information, but you remember that they receive hundreds of emails every day, so don't hesitate to pick up the phone 📞. The decision of the landlord is often taken during the when they meet you. Use this moment as best you can and show the landlord your motivation to get the apartment by bringing your complete file, including the Certificate of Eligibility to the guarantee in a printed version. 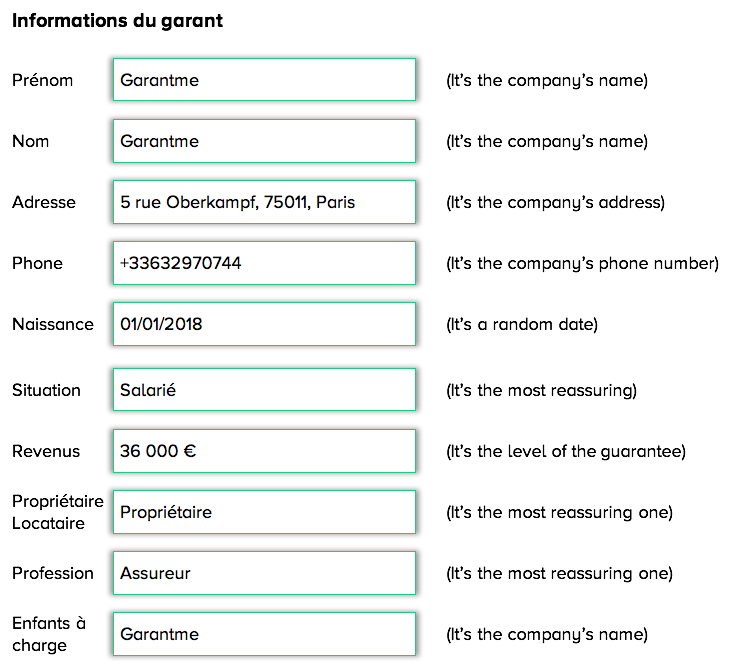 Option 1: Their form offers the possibility to choose a company as a guarantor 😊. You should use this option, declare "Garantme" as your guarantor and upload your Garantme Certificate. Option 2: Their form only offers the possibility to have a physical guarantor 😌. But there is good news 😇: you can still use in this case. Below are our tips to adapt your application to their form. For any other information that they ask, you can randomly fill it in. There is no automatic analysis, they always look at information and will expect your Certificate of Eligibility to the Guarantee to be shared. If documents are compulsory, you should upload that of your parents in addition to the . You can add the Certificate of Eligibility to the guarantee your guarantor's proof of revenues. If documents are not compulsory, you can share your Certificate of Eligibility to the Guarantee instead. Don't forget : at any time you can ask us to contact the landlord or the agent whom you have met.